How do species give rise to other, different species? Speciation begins with isolation. In isolation, two parts of a formerly interbreeding population stop interbreeding. Two important types of isolation frequently drive speciation. Geographic isolation is the physical separation of members of a population. Populations may be physically separated when their original habitat becomes divided. A deep canyon could develop, a river could change course, or a drying climate in a valley could force surviving fragments of an original population into separate mountain ranges. 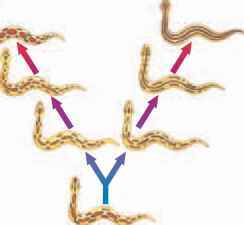 Once the subpopulations become isolated, gene flow between them stops. Natural selection and genetic drift cause the two subpopulations to diverge, eventually making them incompatible for mating. 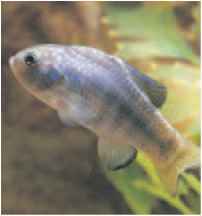 In pupfish, small freshwater fish shown in Figure 16-10, speciation following geographic isolation apparently took place in parts of the western United States, including the desert of Death Valley. Death Valley has a number of isolated ponds formed by springs. Each pond contains a species of fish that lives only in that one pond, but the fish species of various ponds in the area are quite similar. How did these different populations of fish become isolated in Death Valley? Geologic evidence indicates that most of Death Valley was covered by a lake during the last ice age. When the ice age ended, the region became dry, and only small, spring-fed ponds remained. Members of a fish species that previously formed a single population in the lake may have become isolated in different ponds. The environments of the isolated ponds differ enough that the separate populations of fish diverged. Eventually, the fishes in the different ponds diverged enough to be considered separate species. 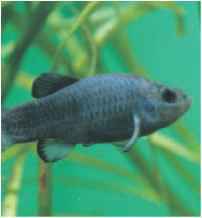 These two types of pupfish live in isolated water sources in the western United States. Both types appear to have evolved from a common ancestor after undergoing geographic isolation. These two closely related squirrels are probably the result of allopatric speciation. The white-tailed antelope squirrel (a) is found on the north rim of the Grand Canyon, and Harris's antelope squirrel (b) is found on the south rim. Word Roots and Origins prezygotic from the Latin prae, meaning "before," and the Greek zygotos, meaning "yoked"
Geographic barriers can be formed by canyons, mountain ranges, bodies of water, deserts, or other geographic features that organisms cannot cross. In addition, parts of a population may be accidentally transported to new islands or slowly drift apart on separate continents. On the geologic time scale, the processes of geology frequently rearrange populations. Whether or not a geographic barrier will isolate a particular group of organisms depends on the organisms' ability to move around. Birds, for example, can easily fly back and forth across a deep canyon. However, a canyon might be a major barrier to a small, crawling mammal. An example of such a barrier is the Grand Canyon in Arizona. The ever-deepening canyon separates the habitats of two closely related populations of squirrels, shown in Figure 16-11. These two populations are different enough to be considered separate species, but similar enough that scientists debate whether they might simply be subspecies. Because their ranges do not overlap, the two populations do not interbreed. Allopatric speciation happens when species arise as a result of geographic isolation. Allopatric means "different homelands." Populations separated by a geographic barrier no longer experience gene flow between them. So, the gene pools of each separate population may begin to differ due to genetic drift, mutations, and natural selection. Allopatric speciation is more likely to occur in small populations because a smaller gene pool will be changed more significantly by genetic drift and natural selection. The key question in this type of speciation is whether or not the separated populations become different enough to be reproductively isolated from one another. In other words, if the geographic barrier is removed, could the two groups interbreed and produce fertile offspring? Sometimes, groups of organisms within a population become genetically isolated without being geographically isolated. Reproductive isolation results from barriers to successful breeding between population groups in the same area. Reproductive isolation and the species formation that follows it may sometimes arise through disruptive selection. Remember that in disruptive selection, the two extremes of a trait in a given population are selected for and the organisms begin to diverge. Once successful mating is prevented between members of the two subpopulations, the effect is the same as what would have occurred if the two subpopulations had been geographically isolated. There are two general types of reproductive isolation: prezygotic (pree-zie-GAHT-ik) isolation and postzygotic isolation. Prezygotic isolation, or premating isolation, occurs before fertilization, and postzygotic isolation, or postmating isolation, occurs after fertilization. As the graph shows, frogs that share habitats may be reproductively isolated by differences in timing of mating activity. If two potentially interbreeding species mate and fertilization occurs, success is measured by the production of healthy, fully fertile offspring. But this may be prevented by one of several types of postzygotic isolation. The offspring of interbreeding species may not develop completely and may die early, or, if healthy, they may not be fertile. From an evolutionary standpoint, if death or sterility of offspring occurs, the parent organisms have wasted their gametes producing offspring that cannot, in turn, reproduce. 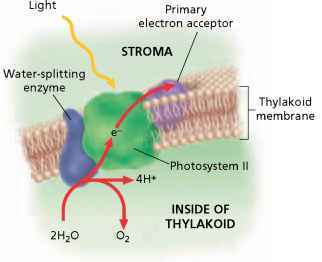 In contrast, prezygotic isolating mechanisms can reduce the chance of hybrid formation. For example, a mating call that is not recognized as such by a potential mate can contribute to isolation. Differences in mating times are another type of prezygotic isolation. Both mechanisms are in effect for the frogs shown in Figure 16-12. The time of peak mating activity differs for each frog, reducing the chance of interbreeding. 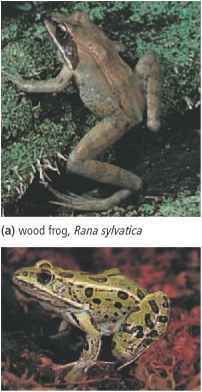 As a result, the wood frog and the leopard frog, shown in Figure 16-13, are reproductively isolated. Though these two frogs interbreed in captivity, they do not interbreed where their ranges overlap in the wild. The wood frog usually breeds in late March, and the leopard frog usually breeds in mid-April. Sympatric speciation occurs when two subpopulations become reproductively isolated within the same geographic area. Charles Darwin proposed this model of speciation in the 1850s. He hypothesized that competing individuals within a population could gain an adaptive advantage by using slightly different niches. This specialization could lead each group to become reproductively isolated from the other. For example, a population of insects might live on a single type of plant. If some of the individuals from this population began to live on another type of plant, they might no longer interbreed with the original population. The two groups of insects would then be able to evolve independently and could eventually become two different species. Differences in peak mating times and in mating calls appear to have led to reproductive isolation of the wood frog (a) from its close relative, the leopard frog (b). In the model of speciation shown on the left, species evolve gradually, at a stable rate. In the model of speciation shown on the right, species arise abruptly and differ noticeably from the root species. These species then change little over time. When two subpopulations become reproducivly isolated with the same geographic area? What makes the antelope squirrel speciation? How do different species diverge from a common ancestor from isolation?